The SEI Insta-Berm is a fully collapsible berm for secondary containment. The L-shaped rods hold up walls, but fold down easily for entry and exit. It's a fully collapsible system. The particular wall design allows vehicles to be driven in and out of the berm. Very rapid deployment without any specialized tools. Highly cost-efficient compared to air-inflated models. Storage of toxic materials and prevention of spillage. Mostly used for waste water, petroleum products and other chemicals. 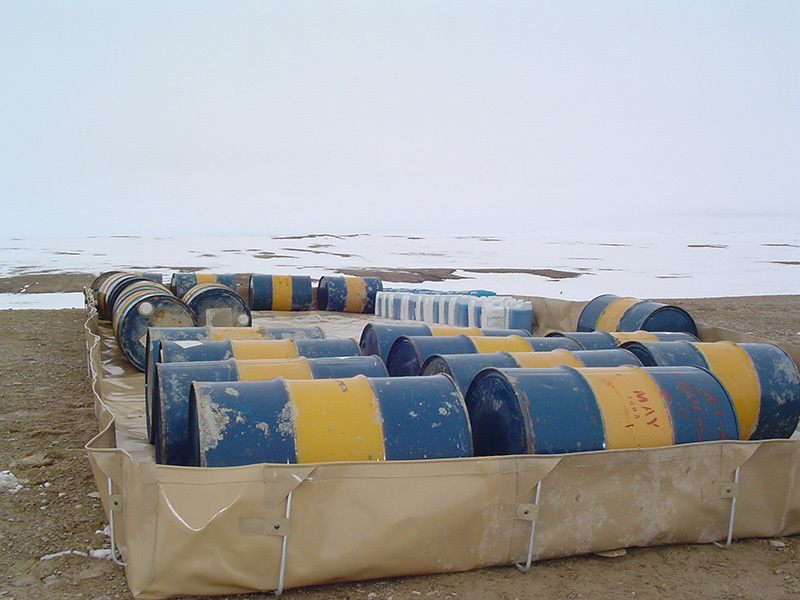 The SEI Insta-Berm provides secondary containment under fuel tanks and drums. It's a fully collapsible berm that is easy and quick to deploy. The Insta-Berm guards against toxic spillage and is made from chemical resistant materials. This berm uses L-rods inside fabric pockets to provide support. It can be used in nearly any situation where the need arises for secondary containment or storage of toxic materials. The Insta-Berm is constructed with temperature-proof Artic-Shield fabric, which has a resistance to -50 degrees F / -46 degrees C.
The Insta-Berm comes in many different sized and can also be manufactured to custom size requirements. It can be constructed with different types of fabric, depending on your specific needs.